April was a significant month in the history of the United States. It was on April 19, 1775 that the Battles of Lexington and Concord occurred. These are considered the first military engagements of the American Revolutionary War. It’s possible that some of our chapter members may have a patriot ancestor who fought in these battles. This was the onset of armed conflict between Britain and the Colonialists. Ralph Waldo Emerson described the first shot fired by the Patriots at the North Bridge in Concord as the “shot heard around the world”. As members of the Sons of the American Revolution organization we can look back on this event with great pride as our patriot ancestors led the way to establishing the greatest nation in the world with unparalleled freedoms and liberties. Our speakers for our March dinner meeting were Rev. Gary Beard and his grandson Jordan Meier. 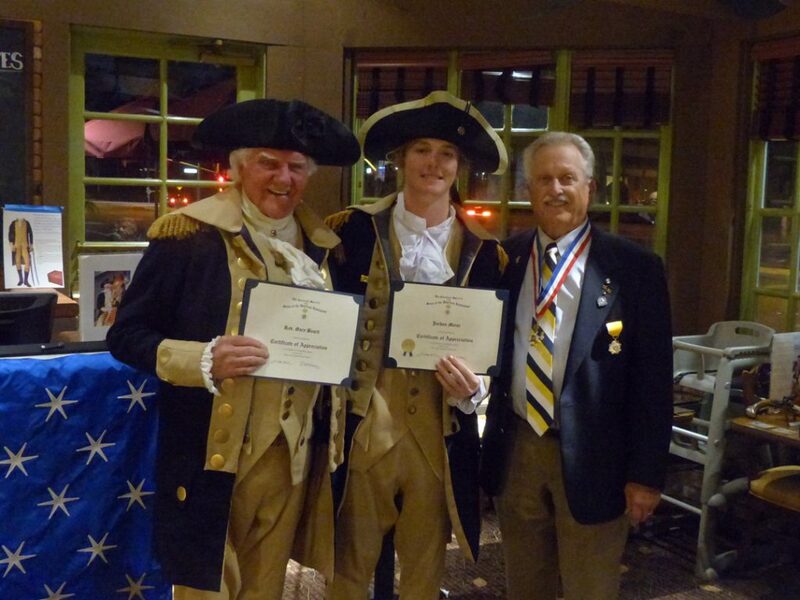 Gary portrayed George Washington and Jordan portrayed a younger George Washington. “Young George” discussed his experiences as a surveyor and his involvement in the start of the French and Indian War. In addition, “Old George” presented us with an exhibit of historical artifacts from the period. Certificates of Appreciation from our chapter were presented to Gary and Jordan by Scott Whitman. This month we will have representatives from the Ocean Institute in Dana Point to present “Tall Ships on Maritime History in The American Revolution.” Their mission is “using the ocean as our classroom, we inspire children to learn”. 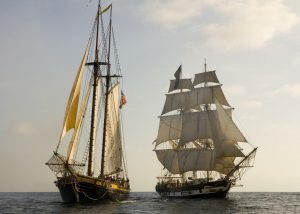 The Institute is located on the Dana Point Harbor and includes teaching labs, an oceanographic research vessel, and two tall ships: the brig Pilgrim, and the Spirit of Dana Point. Was the “shot heard round the world” fired in Lexington or Concord? 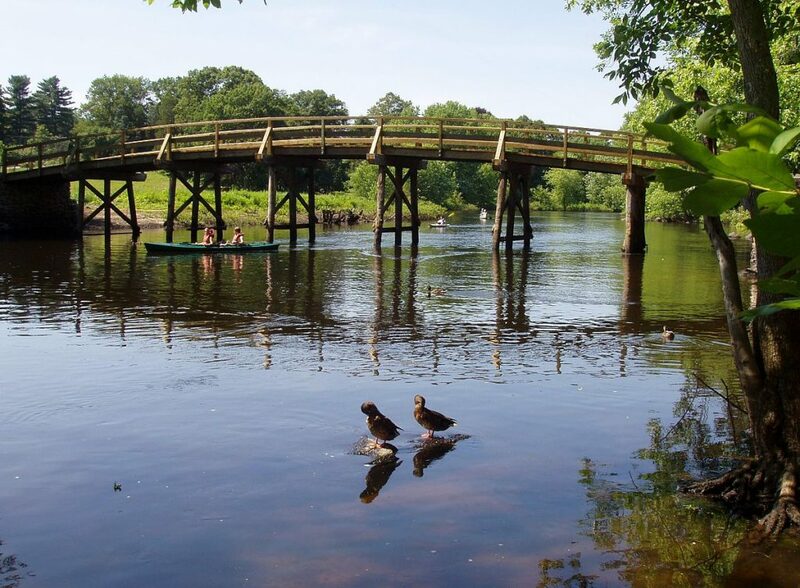 The “shot heard round the world” is part of a line in “The Concord Hymn,” written in the 1830’s by writer / philosopher Ralph Waldo Emerson for the dedication of a monument at the site of Concord’s North Bridge. No one can dispute Lexington’s claim to the first shots, and sadly, the first colonial casualties of the Revolutionary War. However the “shot heard round the world” is not a reference to the first shot. Emerson’s poem is definitely referring to the fighting at the North Bridge, where colonial militiamen were first ordered to fire on British soldiers, thus committing treason. Here also the first British soldiers were killed. However, in a larger sense, was Emerson actually referring to a musket shot? Some argue that the true “shot heard round the world” is not a physical musket shot, but the ideals of liberty and self-determination. It was for the defense of these ideals that people all over New England were roused into action against the British in April of 1775. ⁠And fired the shot heard round the world. ⁠Down the dark stream which seaward creeps. ⁠When, like our sires, our sons are gone. ⁠The shaft we raise to them and thee.